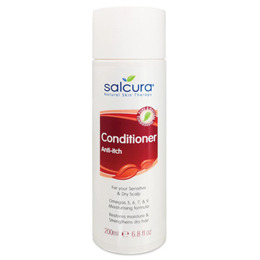 Salcura Conditioner is an effective paraben-free, regular use hair conditioner for dry and itchy scalps. An ideal compliment to Salcura Shampoo, as well as dealing with a problem scalp it leaves hair feeling replenished with it`s fullness restored. 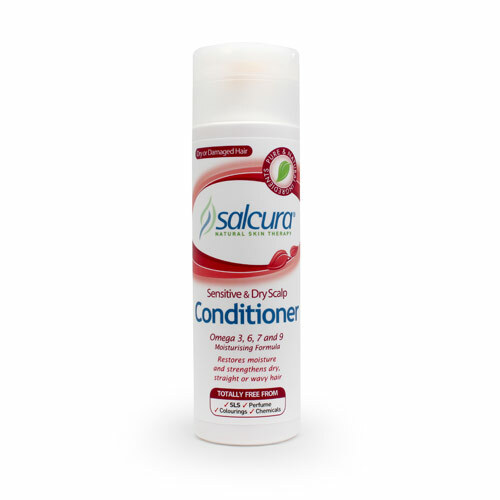 Salcura Conditioner is a unique product that deals with damaged hair and scalp at he same time. Used as an integral part of your hair wash routine, it will nourish, moisturise and restore dry, itchy, irritable and aggravated scalp skin. Alongside Sea Buckthorn we use Wheat Germ Oil to heal the skin with high levels of vitamin E (this does not contain gluten). These two key ingredients, in partnership with other natural vitamins minerals and oils are specially blended to promote skin cell tissue regeneration and moisturisation. Aqua, Cetyl Alcohol, Behentrimonium Chloride, Borago Officinalis Leaf Extract, Phenoxyethanol, Isopropyl Alcohol, Hippophae Rhamnoides Kernel Extract, Citrus Aurantium Dulcis Peel Oil Expressed, Ethylhexlglycerin, Caprylyl Glycol, Helianthus Annuus Seed Oil, Beta-Carotene, Citric Acid, Rosmarinus Officinalis Leaf Extract, Limonene. Below are reviews of Salcura Omega Rich Moisturising Conditioner - 200ml by bodykind customers. If you have tried this product we'd love to hear what you think so please leave a review. Brilliant. Moisturises my dry coloured hair and clears the psoriasis in my scalp. Winter is coming...central heating dries hair/skin. this conditioner does a marvellous job of leaving hair soft, manageable, without the usual SLS parabens. In short... it does what it says on the bottle! Is a very good conditioner works very good for my sons dry flaky scalp best product used by far.Also I use it lovely gives healthy hair, no itchy scalp. Regular buying this, excellent product,highly recommend.